September is Pain Awareness Month. Originally started in 2001 by the American Chronic Pain Association, this annual event raises public awareness of issues around pain and pain management. With this in mind, now is a great time to learn about symptoms of pain in cats and dogs. Cats and dogs experience many types of pain, just like we do. Think about the last time you had the flu, or had a sprain/strain, a broken bone, or just a scratch. Each of these injuries and/or illnesses are unpleasant to experience and causes a different type of pain. Our pets can also be prone to these conditions, and others, that lead them to feel pain. So how can we tell if our pet is in pain? In some cases, it is quite easy, because they show us they hurt. But in other cases, it may not be so obvious because they can’t tell us. Below are some obvious and not so obvious signs of pain in pets. It is important to recognize these symptoms may indicate pain. Depending on the type of pain your pet is experiencing, different treatment options will exist. Working together, you and your pet’s veterinarian can determine the best treatment plan to help your pet feel better. 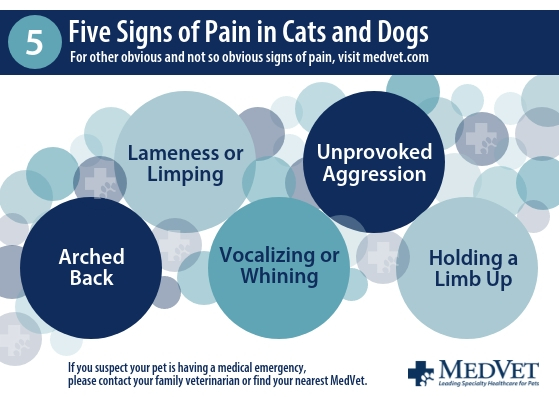 If you notice your pet displaying signs of pain, contact your pet’s veterinarian immediately. Do not, however, give your pet any human pain medication unless directed to do so by a veterinarian, as certain human medications are toxic to pets and can make them feel worse. If your veterinarian is unavailable or you feel the situation is an emergency, contact your nearest MedVet.